today's polish is Orly Blue Collar, a stunning turquoise blue cream. the name is a little off to me, when i think of blue collar 'blue collar workers' springs to mind; especially 1950's female factory workers... and they traditionally wore a light, non-saturated blue. 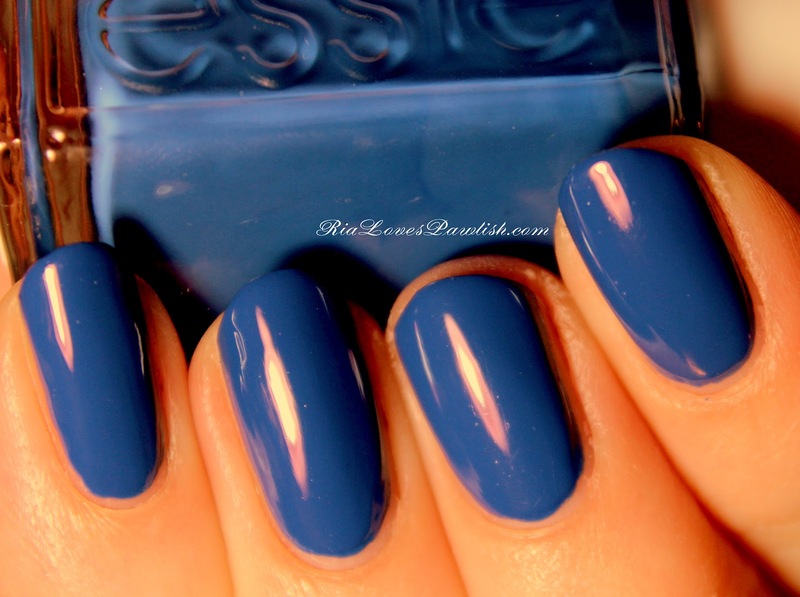 this color is BRIGHT and very saturated... i'm madly in love with it! it's not quite neon, but it's noticeable and sassy... always a plus :) the formula was awesome, almost opaque at one coat and perfect at two. it dried quite shiny on its own; with one coat of Seche Vite it has that perfect thick look i adore so much! one coat Seche Clear, two coats Blue Collar, one coat Seche Vite. today's a swatchie day! i've also got to get our housing locked in for our move to Cali... we leave in less than two months! the mind boggles. today's polish is Orly Sapphire Silk, a lovely medium toned dusty blue cream with green undertones. the formula was okay, i used three coats to get the perfect evenness i like... but i think part of the patchiness was my fault, i didn't have enough polish on the brush for most nails. the Orly brush just isn't my fave. however, i love the color! one coat Seche Clear, three coats SS, one coat Seche Vite. i hope everyone is having a great weekend! my husband is happy because his watch got cancelled for today, so he ended up having a two day weekend after all :) i'm hoping it doesn't rain tomorrow like the forecast is saying... we're signed up to go horseback riding again and riding in the rain doesn't sound fun! China Glaze Optical Illusion is the teal microglitter of the 2012 Prismatic Chroma Glitter collection... it's lovely! it's very similar to China Glaze Liquid Crystal (the blue from the same collection) only Optical Illusion is missing the strong pink duochrome... it's pretty obvious in the bottle, but very slight on the nail. it does have quite a lot of multicolored large glitter pieces and it also has different colors of microglitter... it's a gorgeous polish! 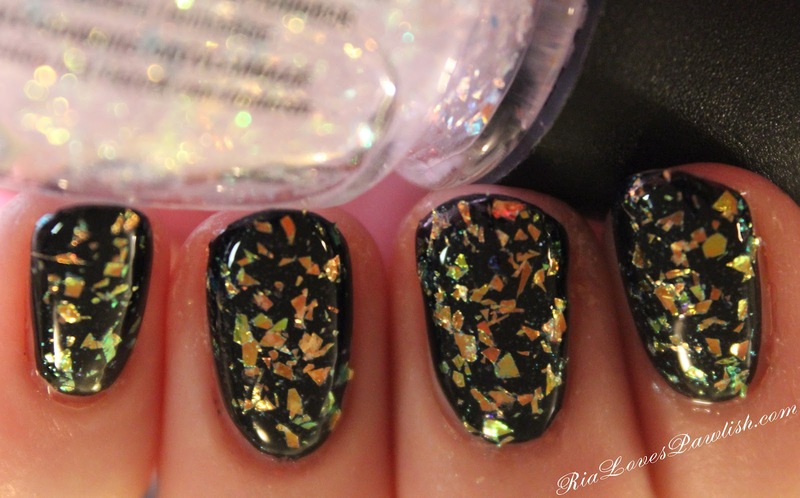 i used two thick coats over black for full opacity, pretty much the same formulation as the rest of the collection. one coat Seche Clear, one coat OPI Black Onyx, two coats Optical Illusion, one coat Seche Vite. 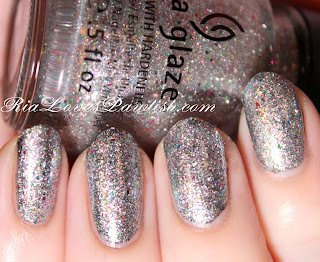 we are looking at my favorite of the 2012 China Glaze Prismatic Chroma Glitters collection today, Liquid Crystal. 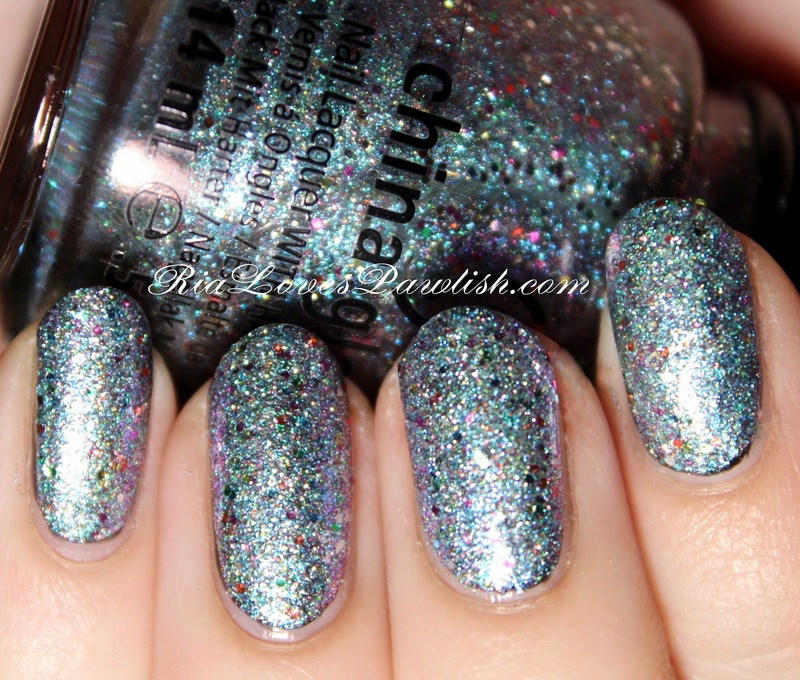 it's a duochrome microglitter that flashes from blue to pink (gorgeous!) with lots of multicolored large glitter pieces. 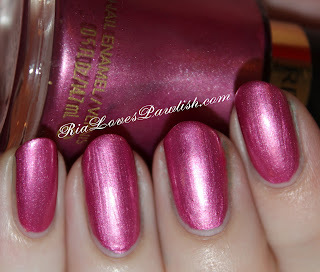 the pink is very shy in some lighting and was impossible to photograph, you can see it best on the edges of the nail! i went ahead with three coats of LC and am very happy with the coverage that gives. with just the one coat of topcoat there is some roughness... it's not scratchy, just textured. i know that really bothers some people, so if you want it completely smooth be aware that these polishes eat topcoat like crazy! one coat Seche Clear, one coat OPI Black Onyx, three coats LC, one coat Seche Vite. 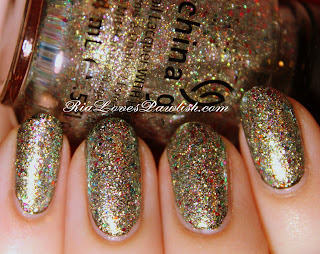 today's 2012 China Glaze Prismatic Chroma Glitters polish is Polarized. this one to me is the least exciting of the collection, if you are going to skip one, i'd suggest this. i do like it, but it doesn't have the duochrome in the microglitters that make the other polishes even more fab. this is one is a silver microglitter base (it does have pink and maybe green microglitter, but silver is by far the dominant color) with larger multicolored glitter. the larger pieces are pretty sparse, just glancing at the mani gives the effect of a simple silver glitter... with that little extra depth to make it special. i used two coats over black, i think i should have gone for three with this one, or used thicker coats... the black wasn't noticeable in person but i feel it would have looked slightly more finished with just a touch more coverage. one coat Seche Clear, one coat OPI Black Onyx, two coats Polarized, one coat Seche Vite. woo hoo, i'm so happy today! Dr. G Medical Examiner is on OWN... i was SO mad when the Oprah Winfrey Network took over Discovery Health and i couldn't watch Dr. G anymore. so, of course, i'm glued to the tv right now! 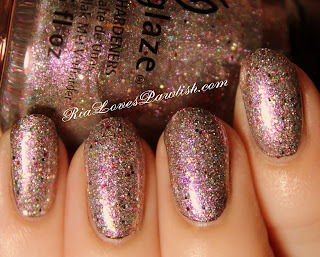 we're starting up the reviews of the 2012 China Glaze Prismatic Chroma Glitters collection today with Prism. 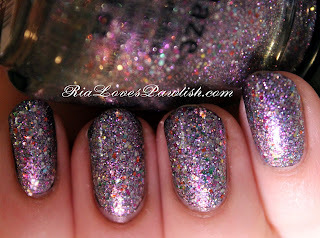 it is a gorgeous glitter that is unlike anything i've ever seen... the whole collection is so amazing and unusual! Prism is comprised of multicolored glitter pieces set into a duochrome micro-glitter base. the base color shifts from a light silvery blue to a pinky purple... it's just awesome! i used two coats over a base of OPI Black Onyx. this glitter is very opaque, so one coat over a base will give you quite a bit of coverage... it's not the usual sparse glitter topcoat. i did use two coats of SV hoping to get that polished glass finish, but this polish ate up the topcoat, for the rest of this collection i'll just be using one coat. 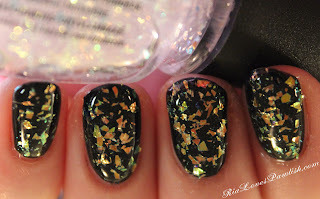 one coat Seche Base, two coats OPI Black Onyx, two coats Prism, two coats Seche Vite. 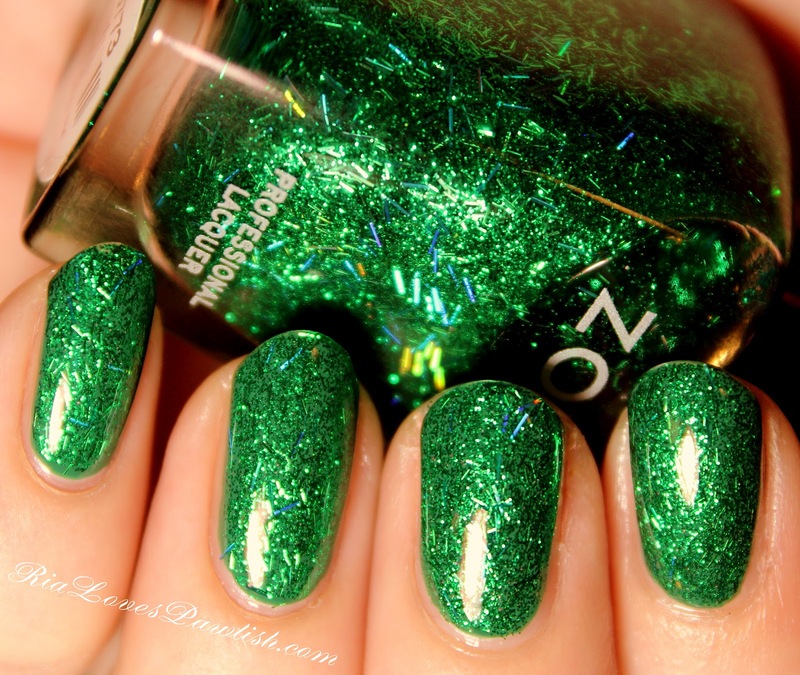 my St. Patty's manicure is... green glitter! I used two thick coats of Zoya Rina (which was all i needed to give the effect of full opacity!) ..... over OPI Jade Is The New Black. Zoya is comprised of lots of green micro- green with some green bar glitter and tiny smattering of holo bar glittering. i am a little disappointed because the holo bars were more noticeable in the bottle. the color is a saturated, warm kelly green (makes you think of the lush grass in Ireland).... it's beyond perfect for a party day mani! the only downer is that parts of the polish dried rough because of the bar glitter. as with all bar glitter i've used, parts of it hung off the nail tips, despite my best efforts to push it back. After two coats of Seche Vite, most of it was smooth, but i did have a couple nails that had slightly jagged tips. 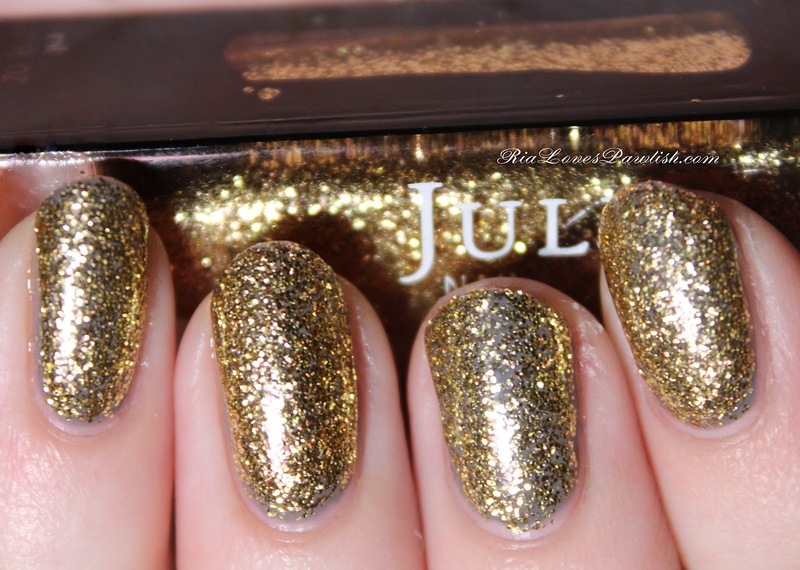 as always, this glitter cannot be done justice in a photograph! one coat Seche Base, one coat OPI Jade Is The New Black, two coats Rina, two coats Seche Vite. today we are checking out China Glaze Electrify from the 2012 Hunger Games collection. it's a gorgeous glitter with tiny gold and large red hexagonal pieces. i was able to achieve complete opacity in three coats! the formula is a bit thick so you do have to allow for some dry time... while the top dries really quickly the middle wants to stay squooshy. the good news is it dried smooth so there was no need for a top coat! one coat Seche Base, three coats Electrify. i'm having a boring day, cleaning and catching up on Tivo! i'm loving the new Bravo show, Shahs of Sunset... most of them lead such a fabulous lifestyle. it was highly amusing when one girl got angry because she was accused of wearing H&M... the mind boggles. 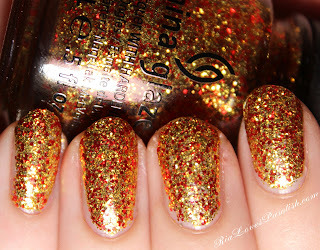 today we are looking at another 2012 China Glaze Hunger Games polish, Riveted. this one is delicious! 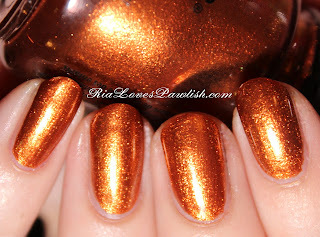 it's a shimmery, saturated metallic orange; i have to say it's my pick from the collection. 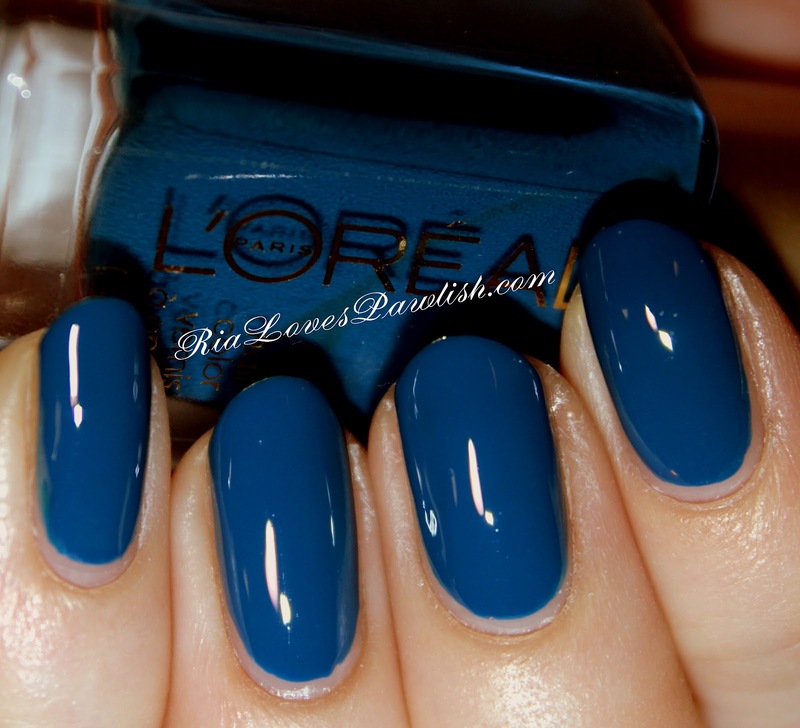 to find a color this vibrant and opaque in two coats is a huge win! 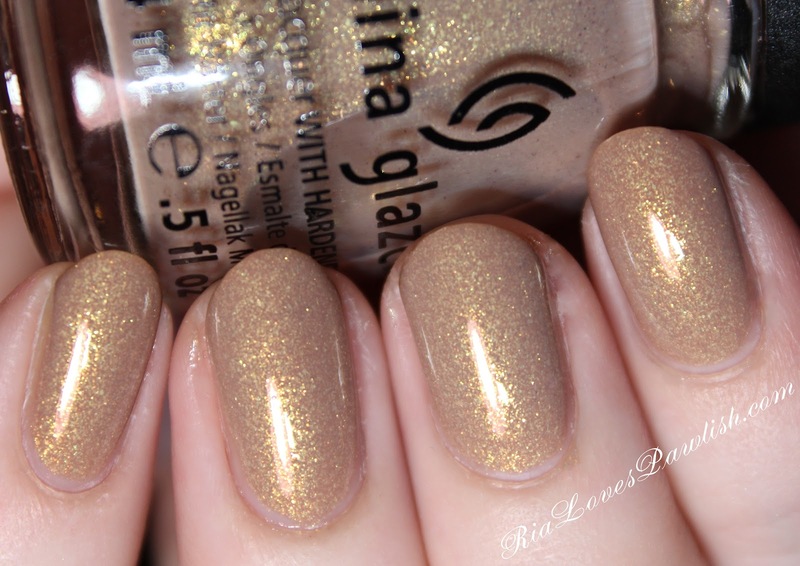 i have some colors similar to this, but they are all glazes that would take eleventybillion coats to achieve opacity. 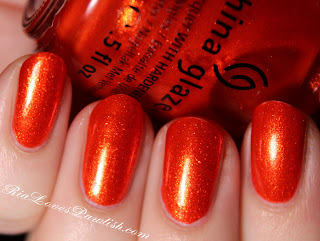 outside it becomes this sparkling orange fire, it's a polish that will get noticed and complimented! 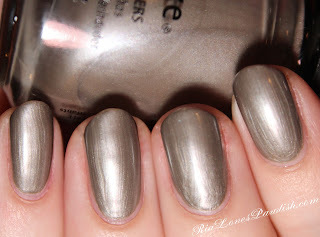 one coat Seche Base, two coats Riveting, one coat Seche Vite. 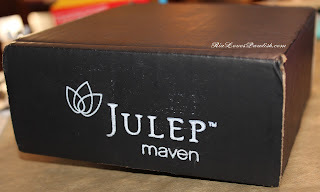 i got my March box from Julep today! the topcoat i used for today's mani is what locked me into buying the box... it's so delicious. 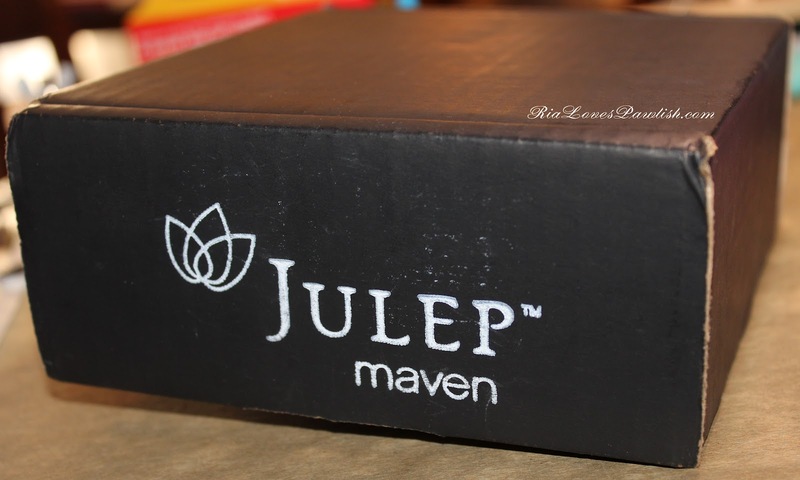 this box came like the usual boxes, large with crinkly paper and the polishes wrapped in paper and ribbon. the treatie that came with the polishes is a nail file, i will probably just give it away because i only use the big fat Revlon file (can't remember the actual name)... i'll have to do a review on it! 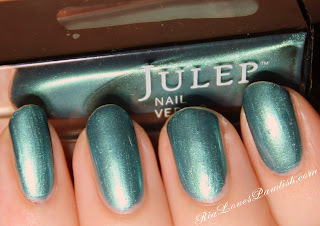 the colors i used for the mani are Julep Charlotte under Julep Melissa. Charlotte is a pretty warm lilac cream with some greY undertones (it's a little more greYed out than the swatchie shows)... it's probably a very dupe-able color, but the formula is a winner! it's another one coater with a weird formula, it does take a few strokes to even everything out... but this one didn't want to bubble like some Juleps! 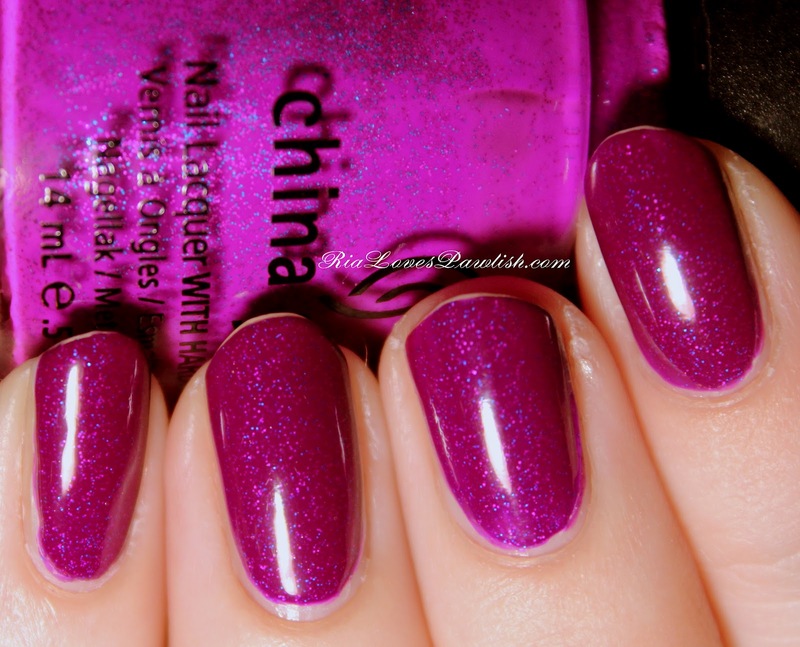 i think it's a great polish, if you are looking for a medium toned purple cream this one's a good option. the polish finish was far more shiny than it looks in the picture, i put Vaseline cocoa butter gel body oil on my cuticles and it matted down the finish. i hate it when that happens! Melissa is an outstanding duochrome that flashes from light teal to purple, adding it over Charlotte really amps up the visibility of the purple flash. some people won't want this one because is it does have a frosty finish with some brushstrokeyness... but it is a true duochrome! i'm always drawn to these colors, they are just so beautiful. 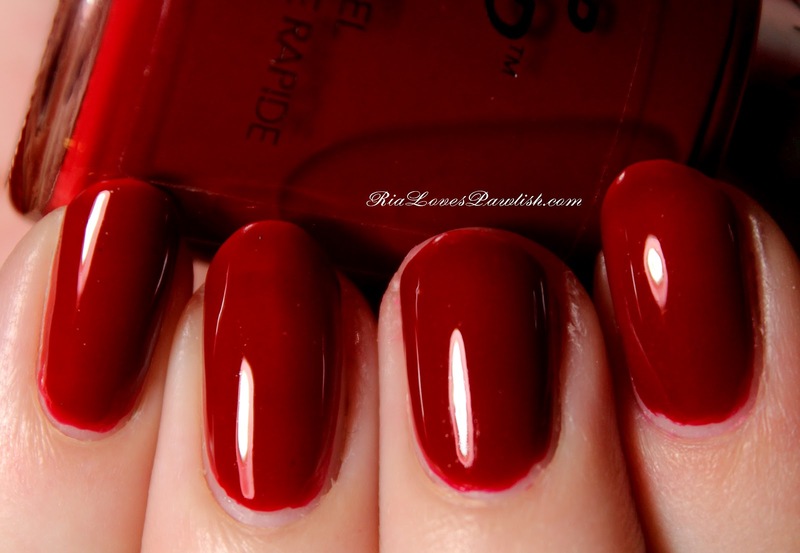 one coat Seche Base, one coat Charlotte, one coat Seche Vite. one coat Melissa, finish the whole mani off with one coat Seche Vite. 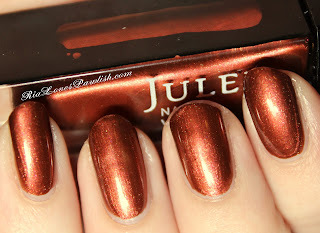 today we are looking at Julep Hayden, a light orangey peach cream. this color is not a true neon, but it is super bright! my first thought was... orange sherbert! (which immediately led to being depressed about not having any orange sherbert) it looks a little weird on me, but that's okay, i'm sure i'll wear it anyway. i'm thinking this polish will look its absolute best on really dark skin tones... it gives my super fair skin a yellow cast (but again... that's never stopped me from wearing something i like before!). to give you an idea of my skin tone, i always have to buy the lightest foundation a brand makes, and many (even high end companies) don't make anything even close to being light enough, which is why i use Lancome. 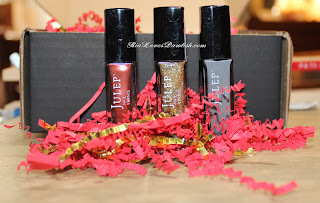 (a little plug for my favorite makeup brand!) 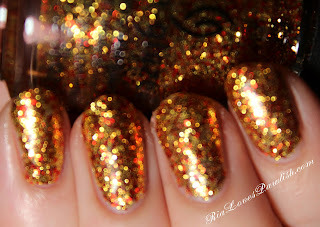 Hayden's formula is just like the previous Juleps, two coats for full opacity... but a weird formula. it's somehow thick and runny at the same time... not sure how that's possible. 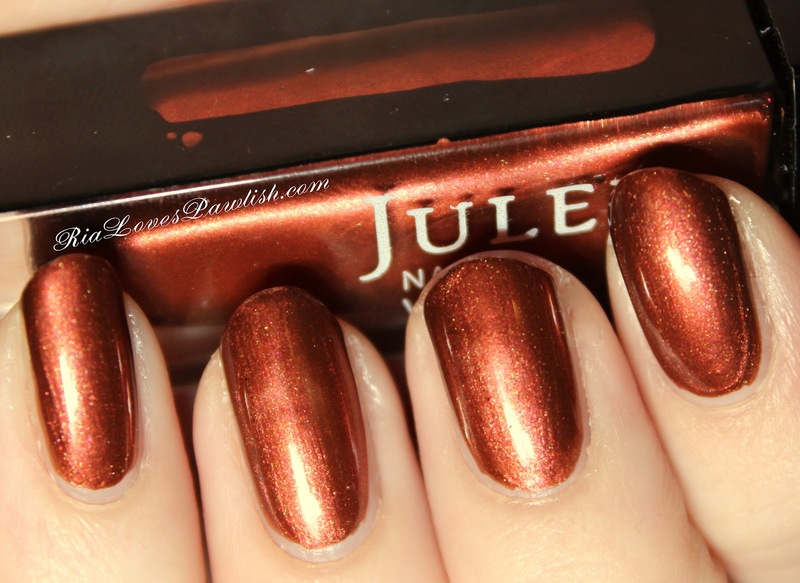 while Juleps dry fairly shiny on their own, the polishes' best friend is Seche Vite... anything the slightest bit uneven is smoothed over and given a delicious mirror shine. one coat Seche Base, two coats Hayden, one coat Seche Vite. 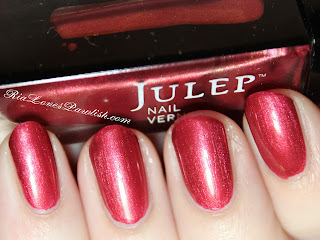 today starts off Julep polish reviews, first up is Meryl and Oscar! since i got a greY and a glitter in my first box, i had to try those first (of course!!). Meryl is a gorgeous medium toned greY cream... effortlessly chic. it's a color i think of as elephant greY... like the color of the crayon you'd use to color an elephant in a coloring book! i was hoping to need only one coat, but the formula was much more suited to using two thin/medium coats. the formula is a little bizarre... at first you think you don't have much polish on the brush, but as you swipe the brush more appears (i guess it slides down from the top). it was a bit prone to bubbling, but this could have been more from my utter lack of comprehension of the formula (one coat of Seche Vite evened everything out, no bubbles to be seen)! the brush is super similar to a China Glaze brush, quite long and thin. since i'm a big fan of the short fat brushes, i was a bit disappointed. however, upon thinking about the brush versus bottle ratio, it completely makes sense... you need a long brush to be able to reach the bottom of the bottle! layered over Meryl is Oscar, a super dense gold glitter. 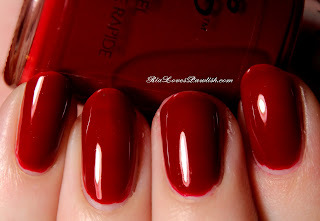 for this manicure i used two medium coats of Oscar over my base of Meryl. i think three coats would make this opaque on it's own... in the pictures you can see a touch of Meryl showing through, but in person you really can't see Meryl at all. putting it over a darker color added a lot of depth to the mani, especially since this glitter had chunky look by itself. surprisingly, it dried pretty smooth! i (as always) added a topping of Seche Vite, just to really bring out all the shinies :) i love manicures comprised of complete glitter, and this one was no let down! personally, i wear stuff like this all the time, but it'd be a great look to wear to a ball or formal dance... adds that extra bit of zing. one coat Seche Base, two coats Meryl, one coat Seche Vite. two coats Oscar, finished off with one coat SV.